Today, there will always be more to do than you have time for, so how do you decide where to invest your time? You can either let the world tell you what to do – and just do what’s asked of you or you can take the lead and invest your time in achieving an impact. Know your time. Use a diary to track where you spend your time – how long your meetings take and how much time you spend doing the work that helps you deliver on your key priorities. Once a month, review your work against the monthly objectives you were expecting to achieve to see how accurate you are at managing your time. What wasted your time? What can you do about it? Know your strengths. What work comes easily to you and makes the time fly? What do you enjoy doing that adds value to your team? How can you do more of this? Have you chatted to your team to explore ways that you can focus more on this type of work? The secret to a great career is finding 5 minutes each day to do more of what you love and working with others to find ways that they can support you with the work that you don’t enjoy, so that you have the time to do what you love. Focus on value creation. While it’s great meeting people and sharing ideas, you need to focus on how this is creating value and making an impact. As an executive, you are expected to develop relationships that have an impact and create value for others, not just because they are interesting/fun and share your interests. Prioritise. Focus on doing the right things first, and then on doing those things right. There is no point in doing efficiently those things that should not be done at all – this is the surest way of wasting your time. And do only the things that you are good at and are of value – colour coding your spreadsheets to make them look more attractive is a waste of your value. Make the right decisions – ask others for input, ask them to challenge your ideas, ask your clients what they would like and then make decisions about where you spend your time. Don’t keep busy for the sake of it. There is a term for this – LELO – the laziness of being busy. THINK and then act. Don’t just do. Be proactive – don’t wait for someone to tell you what to do – take the lead and come up with a plan that creates value. Think about what our clients value and what will make us more successful as a team. Begin with the end in mind – decide what you are trying to achieve – what are the objectives of our campaigns? Or meeting with our clients? Of sharing information eg CRM – what are we trying to achieve with this. If you don’t understand why you are doing things, ask so that you understand why. Put first things first – by planning your work, you reduce the amount of work you need to do, by identifying partnerships, resources and getting clarity so that the team can support you. Know the Big elephants you are trying to hunt – don’t be an ant stomper, running around doing lots of activity, but not understanding why you are doing things. Think win/win – if you want to achieve at work, then think about how you can support our clients, each other to win together. Think about how you can make work a great place to be, rather than complaining about what’s wrong – it’s a team sport. Seek first to understand, then to be understood – dont make assumptions – ask. 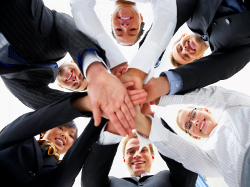 Synergise (creative cooperation) – work together to make our work more strategic and less effort – share ideas/plan work together and think of how your work can support the rest of the team. Present the full portfolio of what Argo can offer, even if you are specialising in one area – so that you create opportunities for the team. Present Argo, not just yourself, when developing relationships. Sharpen the saw – celebrate achievements, spend 2 hours/week thinking about how we can work better together (Monday am) and an hour a week thinking about how you can be more effective (Friday pm good time). ENERGY – be positive, make an impact and create value for others by doing what you love. STRENGTH – focus on your strengths and doing what you are good at. Be disciplined about doing what you SHOULD be doing – what you are good at and what you have agreed to do for the team. Believe in your ideas and be willing to fight for them. Click here to do the Argo Achiever Programme, a time management system available on SAstudy.co.za for FREE!